One of our favorite stops on our Myrtle Beach vacation was the Ripley's Aquarium. My boys love aquariums and as soon as they found out there was one in Myrtle Beach I was told that he HAD to go there. It did not disappoint! It was a smallish aquarium but it was packed with so much to see and do. 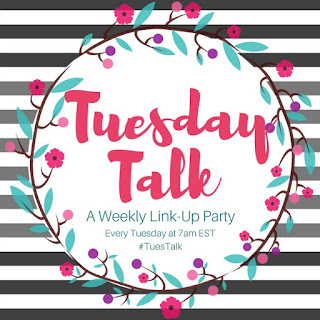 I love when we can combine learning with family fun. These are the types of lessons I know my kids will never forget. Evan took a turn too! The boys all got to touch a jellyfish! 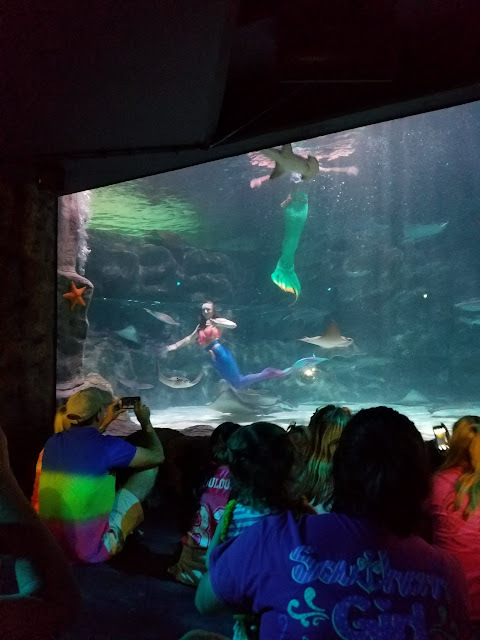 We finished our day off with the mermaid diving show! These lovely mermaids did flips, blew kisses, and interacted with the audience. It's great fun! My boys are finally at that age when they read all the signs on their own and point out to me what they say. I absolutely LOVE aquariums and this one looks so much fun. So cool that there are hands on exhibits too. It was great! Like most kids, mine love anything hands on. Looks like an amazing experience-such gorgeous pictures! I find aquariums mesmerizing and so educational. We have been to the Shedd Aquarium in Chicago more times than I can count! You see new things every visit!! This one looks terrific! I find them mesmerizing too; all that blue/ clear water, the way the fish swim lazily around... very relaxing. I Love aquariums and this one doesn't look too crowded. I love where they can go up in the middle and look like they are part of the fish aquarium. What a great time you must of had. We went as soon as they opened. I have to say by the time we left (around lunch) it was getting crowded. I haven't been to this aquarium yet! It looks awesome! I will add this to our list next time we are in Florida. :) Kids can learn some much on trips like this. We try to always visit zoos and aquariums when we go off on vacation. They're so fun and my boys just love them. It was a really fun morning. A great way to beat the heat when temps are high too. 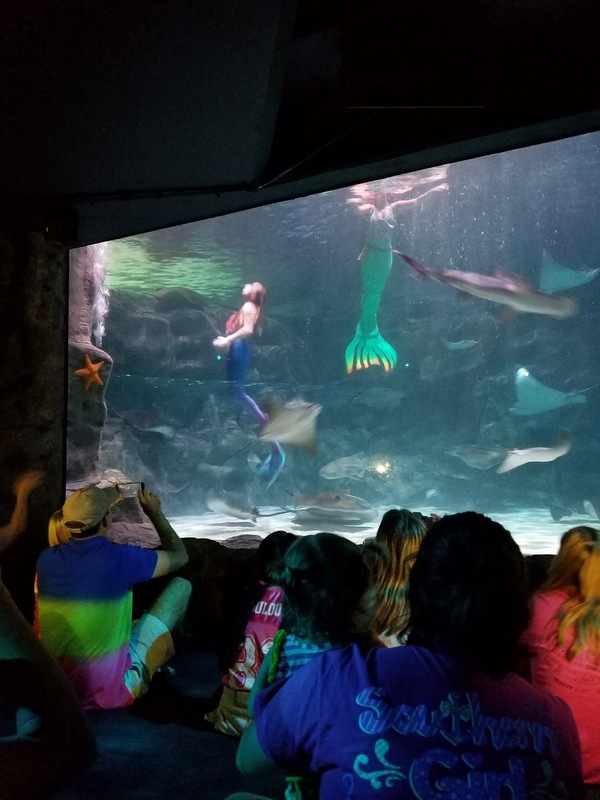 We just loved the uniqueness of the mermaid show. The only time we felt this aquarium was really crowded was during that show otherwise it wasn't bad. It can be quite frustrating to visit places when they are so crowded that you can't enjoy them. Oh my goodness, Ripley's has an aquarium! It looks amazing. I love that there were so many learning and hands on experiences, like jellyfish! I was so surprised to learn that they had an aquarium (and from what I'm reading they have a few of them in assorted cities). It was a wonderful way to spend our morning! That looks like such a fun experience, combined with education. It's definitely a place I'd enjoy visiting. I love seeing different aquariums and zoos; they're always the perfect combination of fun and educational. Looks like you and your boys had a wonderful day. My kids are huge aquarium fans too. I think we have visited one on almost every vacation! I am glad your kids enjoyed it. 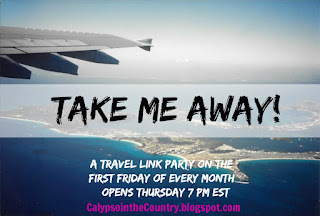 Thanks for linking up to Take Me Away again! We do tend to gravitate towards zoos and aquariums; I do find that they are all so unique.